The Berkshire branch runs at least one event per month, except in August when we take a break. We run public events which are open to everyone, and member events for current and potential members of BCS. We also run special events for local organisations. Sometimes we advertise external events that may be of interest to our members. For further details of external organisations see our links page. Some of our events are supported by volunteers. For full details of each event, and a booking link, click its title. If there is no link, bookings are not open yet, but please save the date. 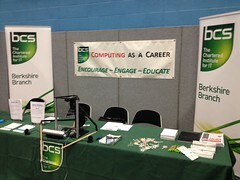 We also run events for schools in Berkshire and support careers fairs in Berkshire, South Bucks and Surrey. See our Schools page for more information. To know more about or help us with any of our events, including for schools, contact events.berkshire@bcs.org.uk . Thursday 9 May, 19:00 - 21:00, Inclusion and Diversity in the Workplace, A 21st century view of diversity and inclusion in the workplace, with a focus on hidden disabilities. Tuesday 14 May, 19:00 - late, Reading Geek Night, Tech Talks on 2nd Tuesday of every month. Free of charge, no booking required. Tuesday 11 June, 19:00 - late, Reading Geek Night, Tech Talks on 2nd Tuesday of every month. Free of charge, no booking required. Tuesday 9 July, 19:00 - late, Reading Geek Night, Tech Talks on 2nd Tuesday of every month. Free of charge, no booking required. Wednesday 17 July, 19:00 - 21:00, Anyone can Code, Dr Edmund Furse, MD of Imitation Ltd, will introduce a powerful new learning method that allows novices to develop applications with no knowledge of progamming - in short, the art of coding by imitation. Free of charge. This will be an updated version of a talk given by Dr Furse to BCS Oxfordshire on 11 October 2018. Because the material is new and under strict copyright, the slides will not be available online. June / July Individual Rights. Jeremy Holt of Clark Holt will provide an update on individual privacy rights in the wake of GDPR. June / July, 5G Networks, The latest on 5G networks, in collaboration with Vodafone and / or Verizon. View speakers slides and videos in MyBCS.